Last year wasn’t great for LG and its G5 phone, an arguably incredibly innovative, but ill-conceived attempt at a modular design. So this year, they played things a lot safer. The G6 is a far more straightforward design, possibly even boring in comparison. However, simplicity can have advantages. The G6 distinguishes itself from the plethora of rectangular smartphones somewhat by being more rectangular than usual. It’s noticeably narrower and longer than most phones thanks to its rather odd, but excellent 5.7-inch screen. It bears an aspect ratio of 18:9 and supports HDR, allowing for more vivid colors. Given that the standard aspect ratio for widescreen TVs and phones is 16:9, this is a rather bold choice. It also means that if you watch a lot of streaming content on your phone, it will show black bars on the sides—essentially making the screen, from a practical standpoint, 16:9. Some content, like Netflix’s Stranger Things, actually does use this newer ratio though and for any other functions of the G6, the aspect ratio doesn’t make much difference. What this narrower size really does, however, is enable the G6 to have a larger screen (with virtually no side bezels) with a body that is physically smaller than a phone like Google’s Pixel XL. LG’s conceptual design here is a full-sized phone that you can comfortably use with one hand. It’s a solid selling point, especially if larger phones are simply too much for your hands. As a larger-handed person, I still prefer the feel and heft of something like the Pixel XL or Galaxy Note, but anyone with smaller hands should find the G6 at the top of their consideration list when shopping for a new phone. The other distinctive facet of the G6 is its camera. The rear camera is actually two 13-megapixel cameras, one of uses a wide angle lens second to none. The camera is overall very solid, competing with the best from Samsung, Google, and Apple, thanks to an excellent image sensor that proved to be intelligent and responsive. Face detection, auto framing, and other options were on par with the competition and the G6 generally produced sharp hi-res shots complete with HDR support. But it’s the 125 degree wide-angle lens that gives the G6 the ability to capture wide shots no other phone can match. This is especially true considering Google and Samsung’s flagship phones don’t offer wide-angle lens period. Even Apple’s latest only goes up to around 75 degrees. This means you can take crowded family or friend photos without cutting off the outlying people or just get really wide shots of the scenery. It’s a nice feature that works well, though there is a slight, but noticeable delay when switching between the wide and standard rear cameras. The G6 even supports a wide-angle capture for its front-facing selfie camera, which is a very singular feature. The extra space certainly allows for a lot more space for creativity and fun whether shooting for the rear or front camera, and for selfie addicts could prove a deciding factor when picking their new phone. LG also uses something it calls “Snapshot” to actually utilize that large display in a convenient way. Essentially, you can take a photo and preview it without having to switch screens—as well as putting together nifty photo collages on-the-fly. Overall, it’s not going to convince anyone to switch from their beloved iPhones or Galaxies (or Pixels for that matter), but it’s definitely an above-average camera with a couple of interesting features for those looking for them. Beyond that, however, this is, for better or worse, a standard Android phone. The specs report in about where we’d expect in 2017: the Snapdragon 821, 4GB of RAM, and 32/64GB of storage. It’s a capable smartphone that can handle pretty much anything you throw at it, but nothing that’ll knock your socks off in any particular way. The phone does come with a larger 3300 mAh battery, though much of that extra juice will be used to power that massive display rather than give you extra screen-on time. LG has tweaked its own version of Android a bit here and there, built upon 6.0 Nougat. Some options are in odd places and the phone defaulted to having all apps simply on what would traditionally be the top home screens, which was weird. The systems options in particular are divided up more extensively like older versions of Android, but this is largely a straightforward version of Android 7.0. Overall, it reverses a lot of the forward momentum we’ve been seeing in Android lately, especially in terms of design language and accessibility. The power/wake up button is also the fingerprint reader on the back of the phone—it looks identical to the Pixel’s in fact. Otherwise, the G6 is a solid performer that does everything Android users would expect. It’s available in both a 32GB and 64GB configuration, though it thankfully has an SD card slot. 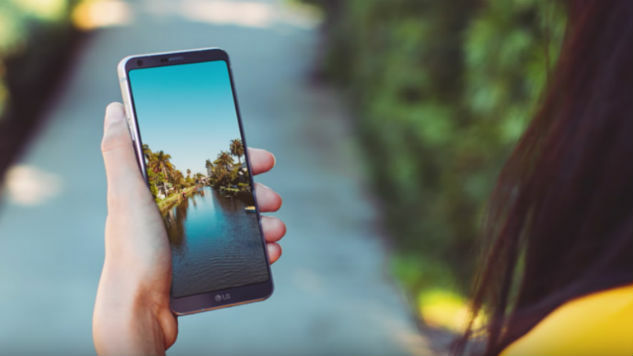 The G6 also runs Google Assistant, the upgraded version of the voice support system, which lets you talk to the phone to search the web, schedule things, control other devices, and perform a wide array of other services. One odd omission, especially for a brand new high-end Android phone, is the lack of support for Google’s Daydream VR headset. Compared to last year’s G5, the G6 seems positively safe and tame in comparison, which was probably the point. There are a couple notable features—the wider aspect ratio and wide angle ability—to at least partially distinguish it from the competition. Still, with Samsung’s Galaxy S8 looming and Google’s flagship Pixel already out, the G6 is likely to have trouble standing out.